Tripura Police Recruitment 2018: Tripura Police has issued official notification for 65 vacancies of Constable. Eligible and skilled candidates can send Tripura Police Jobs 2018 application through offline mode from their official website tripurapolice.gov.in. Interested candidates can make offline application for Tripura Police Constable vacancy 2018 till the last date 05.12.2018. Candidates can download official notifications from the official website before applying for this vacancy. To get more information about Tripura Police Recruitment like eligibility details such as education qualification, age limit, selection process, application fee and how to apply, important links, courses, admission letter, results, last letter, eligibility details like below. The selected candidates will get L-3 PB-01 scale Rs 170000-69100 from the organization. Interested and qualified candidates can download from website tripurapolice.gov.in in prescribed form and send their application on or before 05.12.2018. The prescribed format with photocopy of all relevant documents should be submitted to the address specified below. Police Deputy Commissioner, Chairman Recruitment Board, Camp Office, AD Municipal Police Line, PO AD Nagar Pin 79 9 003, Tripura. Tripura Police Recruitment 2018: Tripura Police has issued official notification for 65 vacancies of Constable. 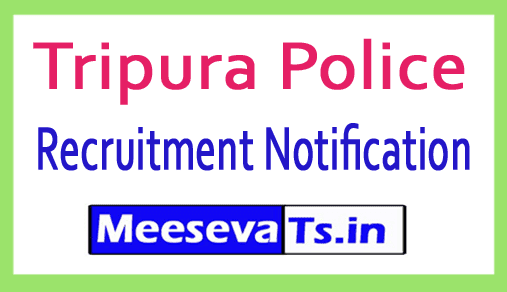 Eligible and skilled candidates can send Tripura Police Jobs 2018 application through offline mode from their official website tripurapolice.gov.in. Interested candidates may make offline application for Tripura Police Constable vacancy 2018 till the last date of 30th October 2018. Candidates can download official notifications from the official website before applying for this vacancy. To get more information about Tripura Police Recruitment like eligibility details such as education qualification, age limit, selection process, application fee and how to apply, important links, courses, admission letter, results, last letter, eligibility details like below. Interested and qualified candidates can download from website tripurapolice.gov.in in prescribed form and send their application on or before 30th October 2018. The prescribed format with photocopy of all relevant documents should be submitted to the address specified below.